Toruk’s spies had failed him. The Scourge Bringer had been rediscovered and he only found out about it weeks after. This failure would have to be rectified, but in the meantime he needed to retrieve the weapon from Everblight’s minions. Toruk does not like to rush things, but in this instance he had to dispatch a fast moving force to advance into the frozen north and take the weapon. He usually fostered, and at times perversely enjoyed, the rivalries of his Lich Lords, but now was not the time for petty jealousy. He issued a direct order to Asphyxious and Venethrax that they must work together to sieze this weapon. He knew neither would receive this order well, but he was sure their mutual distain would push them to take extreme measures on his behalf. The Scourge Bringer must be his. The Frozen North campaign is part of the Cryxian Ambitions arc of The Orgoth Legacy. During this campaign the Cryxian forces clash with the Legion of Everblight in an attempt to sieze one of the three pieces of the Scourge Bringer weapon. It is a team campaign that involves four players and is played over five games, of which the finale is a team game. 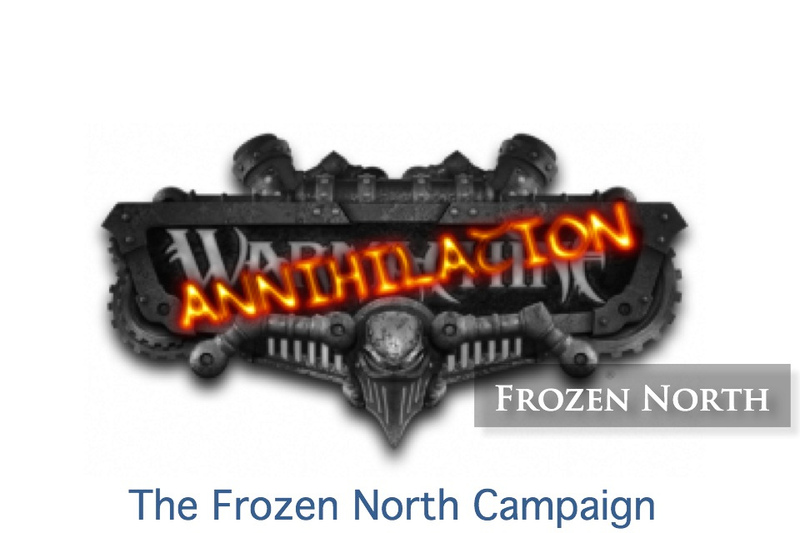 Frozen North (Rules PDF) is a derivative of the ANNIHILATION v1.1 campaign system, so the attrition suffered to each force was going to play a significant part in how the armies fared. Players could pool their armies and decide how they wanted to share losses. As you can see, the Cryx won out in the end after a closely fought campaign. The finale was a do or die game for them as the Legion army was in a more competitive shape following the previous games. Here’s an example of how attrition changes how you approach the game – after a bad start to Game 4, Peter decided to concede to Joe. This was against the backdrop of the losses he had suffered to me in Game 1. Had he not done so, there is a strong chance that the Cryx force for the final game would have been severely weakened. The campaign was great fun, though I think we all agree that the weather rules were a bit annoying! Anthony and Peter deserved the win after playing a great team game. The feats of their ‘casters (eDeneghra and eSkarre) combined nicely and they used them to great effect. With the Scourge Bringer in Cryxian hands the story arc for The Orgoth Legacy has really opened up! I had a great time with this campaign, looking forward to the next part! I’d love for there to be some kind of Asphyxious/Venethrax (or Minions thereof) fight over who gets the piece of Scourge Bringer.